When the first real photos of the upcoming Gladiator (aka JT) leaked, I noticed a few misconceptions about Jeep trucks of yore. Specifically, that the Comanche was the only Jeep pickup truck, or that the Scrambler name that had previously been attached to the JT was somehow a more authentic/retro name than Gladiator. Well, I’m here to disabuse you of false notions. Let’s go back to the beginning (and beyond!) and look at the long history of Jeep trucks. The Jeep CJ/Wrangler models make guest appearances in this series but are not for purposes of this document—or by most aficionados—considered trucks...except for the CJ-8 “Scrambler” and CJ-10. You don’t remember the CJ-10? There’s a pretty strong argument to be made that your selective amnesia is a defense mechanism. Fortunately we won’t see it in this first part, so it’s safe for you to continue reading. Willys-Overland existed long before Jeep, but World War II and the Willys MB marked a dramatic turning point for the company, both in terms of public perception and vehicle design. This is a Willys pickup truck from 1938. While I have your attention here: it’s pronounced “willuhs”, not “willeez”, because that was the founder’s name. However, he was happy to sell you cars or trucks no matter what you called them. This is a Willys pickup truck from 1948. What a difference 10 years made. Swooping curves were out; boxy was in. And you can barely see the MB-style grille...but let’s take a closer look at that. Lots of slots. I can barely count that high. Look: 10 slots! Don’t let Chrysler or anyone else convince you that Jeep is synonymous with 7-slot grilles. This truck, creatively named the “Jeep Truck”, launched in 1947 with the famous 4-cylinder Go-Devil, the engine that helped Willys become one of the primary suppliers of Jeeps to the Army. 1950 saw the replacement of the truck’s original flat grille by a V-shaped grille, and the introduction of a brand new engine to the Jeep lineup: the Willys Hurricane, an F-head upgrade to the Go-Devil’s L-head design. The Go-Devil remained the standard engine for the pickup, with the Hurricane as an option. This V-shaped grille is the third design used for the Jeep Truck (and Willys Wagon), simplified from 5 horizontal slats after the Kaiser merger. The Hurricane engine was considerably taller than the Go-Devil, which led to the distinctive high hood on the CJ-3B in 1953. Eventually the Go-Devil would be retired; the Hurricane, Super Hurricane, and Tornado engines would all be found under the hood of the Jeep Truck over the years. Industrial designer Brooks Stevens left an indelible mark on the U.S. auto industry in general, and Jeep in particular. He designed the Willys Wagon, the Wagoneer, the Jeepster, and Jeep’s quirkiest truck, the Forward Control. Taken at the 2018 Toledo Jeep Fest parade. The FC was being towed by a CJ-3A. The Forward Control was a cab-over design that never caught on with the general public, but found a modest market for specialized applications. The FC trucks came in a few variants (FC-150, -170, -180, and -190), and the U.S. military ordered several hundred. Fewer than 100 of the military trucks are known to survive. One of three FC-150 minivans ever built. To this enthusiast’s eyes, the most appealing FC was never mass-produced. Brooks Stevens designed a minivan based on the first FC, the FC-150. Only three were ever built, and if any have survived, no one seems to know about it. This would surely be the most expensive minivan to ever hit the auction block were one to be discovered. Jeep’s Mighty FC concept vehicle. Each year Jeep pulls out all the stops to create distinctive concept vehicles for Easter Jeep Safari, the annual pilgrimage of off-roaders to Utah. Mark Allen, head of design for Jeep, is a devoted fan of classic Jeeps, particularly the FC trucks. In 2012, Jeep introduced the Mighty FC, a concept truck built atop the JK Wrangler platform; a few years later he persuaded Jeep to buy and restore a 1960 FC-150. A recurring theme in Jeep trucks is that the platform is typically shared with a wagon (or later, an SUV). 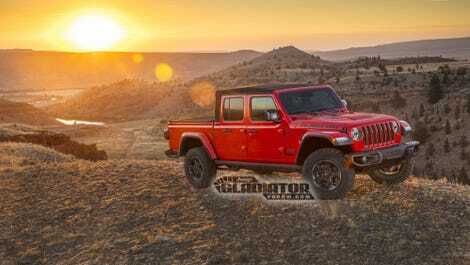 The original pickup truck and the Willys Wagon; the J-series trucks and the Wagoneer; the Comanche and Cherokee; and now the Gladiator and Wrangler. One of the lesser-known combinations is the Willys F-75 and Willys Rural. Willys was struggling in the U.S. market in the 1950s and decided to look to South America for growth. In 1953 they entered Brazil, just before merging with Kaiser Motors. Among other vehicles, Willys built variants of the Willys Wagon and Jeep Truck in Brazil, under the names Rural and F-75 respectively. The front-end on both, however, was unique to the Brazilian market. Willys would also build a military version of the truck, the F-85, which you can see cruising the streets in these YouTube videos (sadly, the truck itself is mostly obscured below camera level). Ford bought a controlling interest in Kaiser in 1967 and took over the Willys factory in Brazil; thereafter, the F-75 and Rural were sold as Fords. I’ve seen conflicting dates on the end of production for the F-75: either 1981 or 1983. Two years after Willys entered Brazil, Kaiser launched a joint venture named IKA in Argentina. The Willys Wagon and Jeep Truck were manufactured there under the names Estanciera and Baqueano, but unlike in Brazil they were not noticeably different from the U.S. models. My next post will introduce the original Jeep Gladiator, a pickup truck that was the first in a long line of Jeep trucks that time has mostly forgotten, but which enthusiasts have definitely not. Stay tuned! In the meantime, in case the 20-some links above aren’t enough to keep you occupied, here are a few more. Keep on truckin’. Or readin’. Or both. Dig the Gladiator pickup? You should get a load of the brand&apos;s bed-tastic history.